With the exception of sandwiches and a couple of entrées, most main courses at the Tavern at the Essex Resort & Spa cost more than $20. But during Vermont Restaurant Week, that's the price of the Tavern's entire three-course prix-fixe dinner. Next door at more upscale Junction, the three-course menu that usually rings up at $50 is just $30. Since I'd reviewed Junction a few months ago, I was more interested to see what was new at the Tavern. I began with what could most accurately be called a Tex-Mex bouchée à la reine. 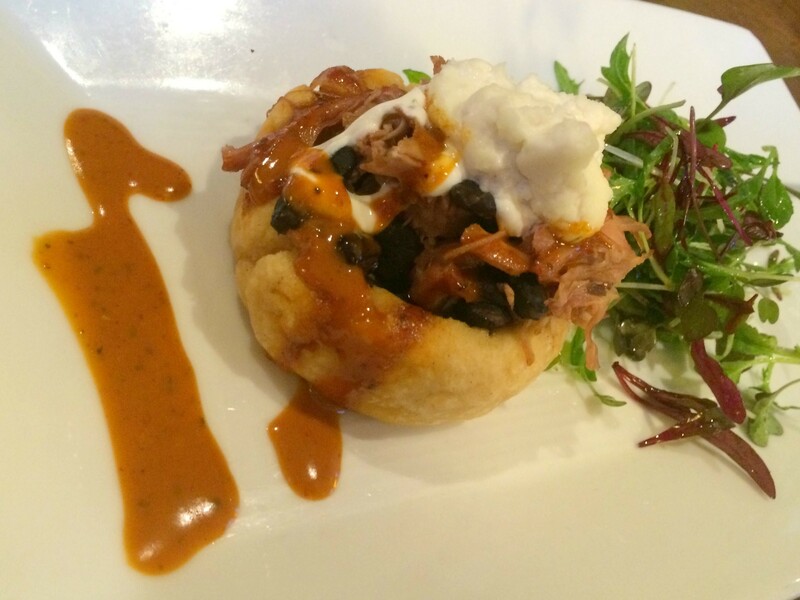 Moist smoked chicken and black beans filled a vol-au-vent made of cornmeal. Swishes of chipotle vinaigrette made the crunchy round of dough taste a bit like vadai — Indian savory doughnuts. A handful of queso on top was a bit excessive, but microgreens on the side added crunch and color, even if they were dressed only in olive oil. 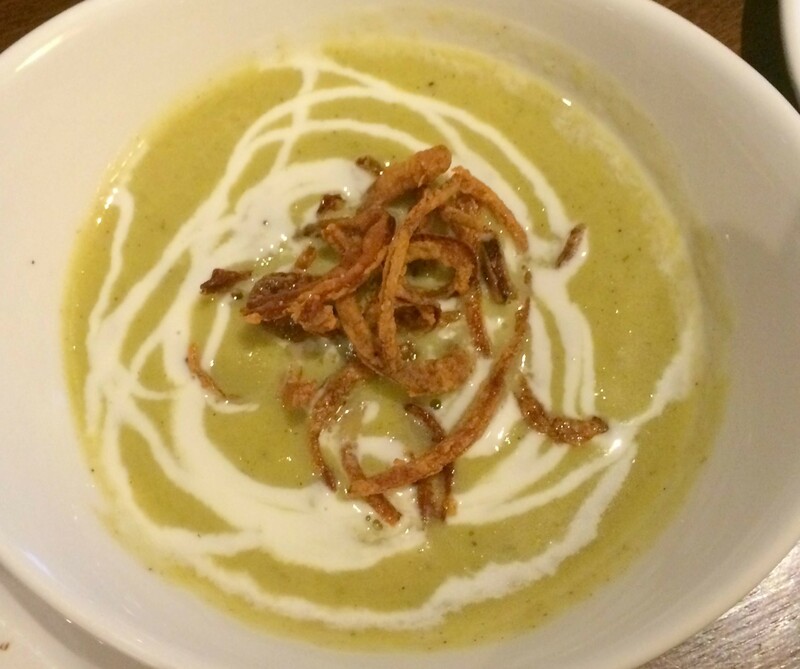 Sweet spring onions were folded with cream for a hearty bisque. A spiderweb of goat-cheese-cream swirls lent acid, while fried onions didn't lose their crackle even at the bottom of the bowl. 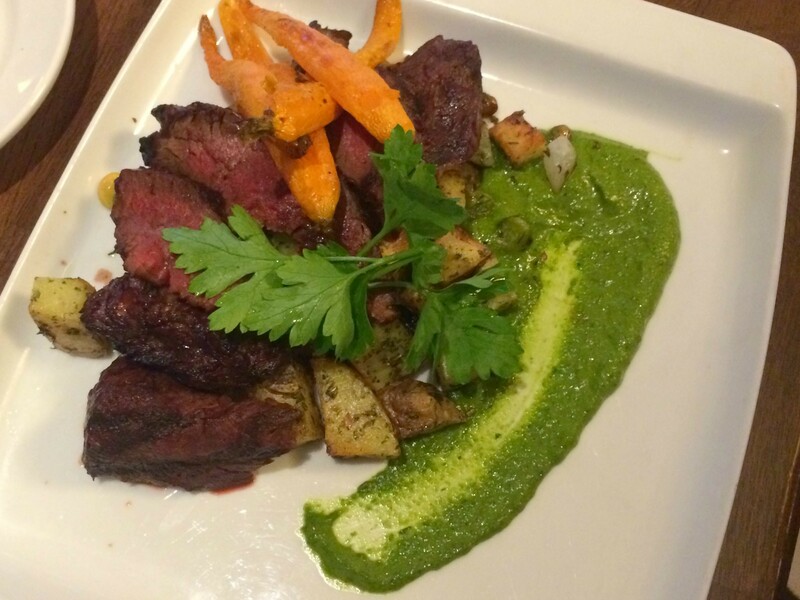 The best deal of the prix-fixe is doubtless the grilled hanger steak. The ample portion of beef was tender and cooked almost ideally medium. It was served with slightly wrinkled baby carrots and a hash of edamame and herbed potatoes with plenty of "green harissa" (indistinguishable from chimichurri) to coat every morsel. 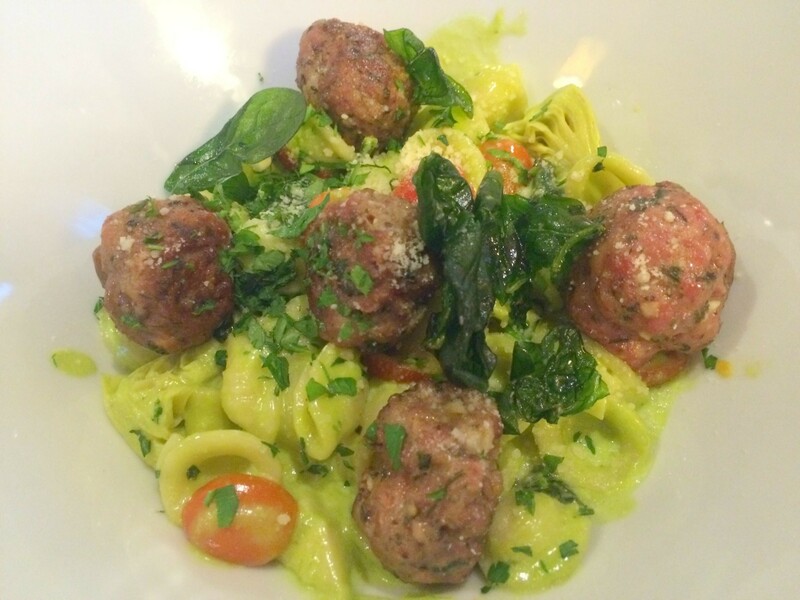 Garlicky pork meatballs may have given the orecchiette entrée its name, but the pasta's bath of spinach-almond-pesto cream was what made it difficult to leave enough to fill the entirely necessary doggy bag. A liberal dose of lemon made the sauce lip-smackingly tangy, but tender artichoke hearts and halved cherry tomatoes did their part as well. Often Restaurant Week menus are portioned so that no single course is quite as gut-busting as it might be on the regular menu. At the Tavern, apps and entrées were unabashedly full-sized. Thankfully, desserts were on the petite side. 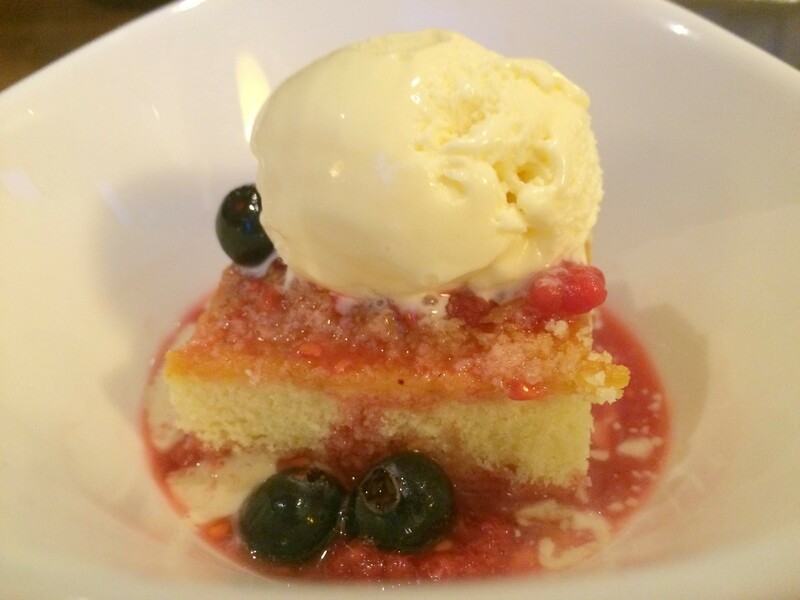 A delicate tea cake was covered in macerated berries and a calendar-worthy scoop of intense housemade vanilla ice cream. 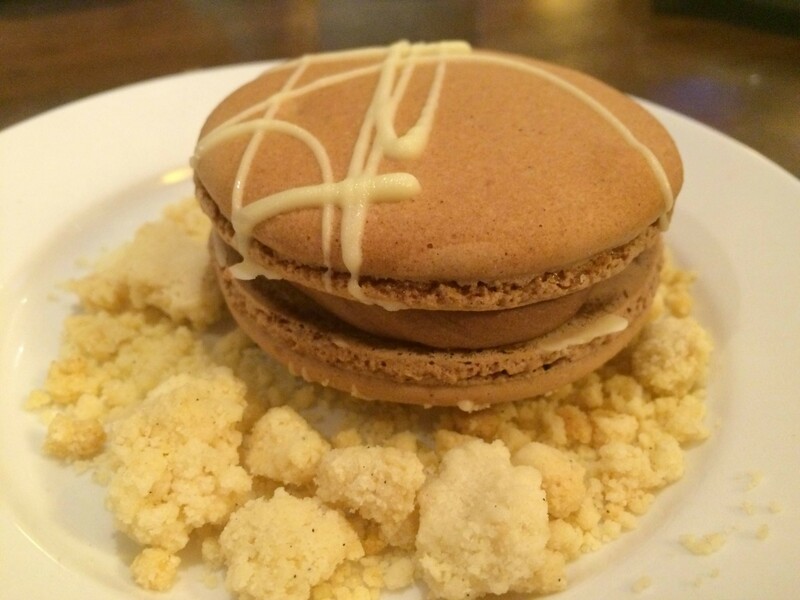 An XXL chocolate macaron filled with ganache sat atop cookie "sand" looking ready to open and reveal Botticelli's Venus. But the creamy chocolate and tart jam within were good enough. Vermont Restaurant Week at the Tavern may not have showy specials or a whimsical theme, but the $20 menu is one of this year's best deals.